Do you own one of these devices? If you've got a Windows Phone with less than 8GB of storage, you may miss out on Windows 10 Mobile. The Windows 10 Mobile upgrade will require 8GB of internal memory, according to the German version of the Windows Blog. 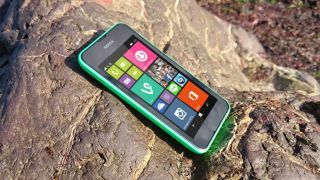 Windows Phones with only 4GB of storage, including the Nokia Lumia 530 and HTC 8S, will not be able to download the new operating system when it becomes available. The nine 4GB devices that will be left off the list are currently unable to join the Insider Preview of the mobile operating system, and one of the device manufacturers, Kazam removed its Thunder 340W, Thunder 450 and 450WL from the potential Windows 10 Mobile upgrade list, according to Windows Central. Although the limitation only applies to roughly 10% of all Windows Phones, this figure is equivalent to 35 million devices worldwide. There are 1.09 billion smartphones in the world, according to consultancy Statista. Phones running on the Windows operating system account for 3.5% of all phones, says the latest IDC market share date, which equates to roughly 350 million Windows devices. Windows 10 Mobile was initially rumored to be made generally available in September. However, recent reports indicate the operating system might not reach the masses until November. Whenever Windows 10 Mobile is made generally available the first devices to get it will be the Lumia 430, Lumia 435, Lumia 532, Lumia 535, Lumia 540, Lumia 640, Lumia 640 XL, Lumia 735, Lumia 830, and Lumia 930. A Microsoft spokesperson was not immediately available for comment. We will update this article when more information becomes available. If you're interested in testing out a preview of the new operating system, check out this primer on how to get it today.